4. On the Basis of Menstruation? 7. 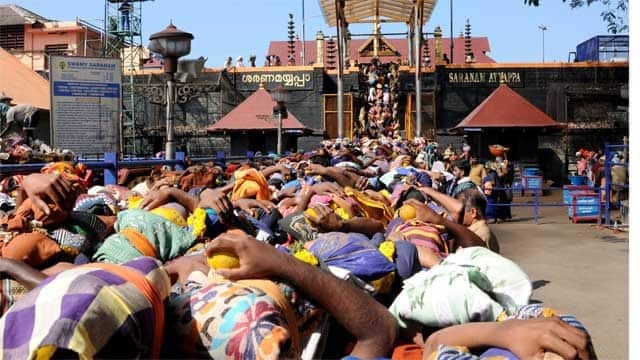 Is Sabarimala Temple State Funded? On Wednesday, 2 January, two women created history by entering the sanctum sanctorum of the Sabarimala temple in Kerala. The entry of Bindu (42) from Koilandy and Kanakadurga (44) from Angadipuram in Malappuram district of Kerala sparked state-wide protests. A 55-year-old Sabarimala Karma Samiti worker, who was injured in the clashes, succumbed to his injuries, news agency ANI reported. Unprecedented high-voltage drama was inevitable as protests grip Sabarimala shrine in Kerala. The protests have Lord Ayyappa devotees on one side, who cite tradition to oppose a Supreme Court judgment overturning a ban on the entry of women into the temple. On the other side, the fight has been spearheaded by women rights activists, who are determined to visit the shrine and uphold the SC’s judgment allowing women of all ages to enter. The SC’s landmark judgment on came on 28 September, and declared the ban on women ages 10-40 entering the temple ‘unconstitutional’ and ‘discriminatory’. The 4:1 judgment was delivered by a five-judge bench consisting then CJI Dipak Misra and Justices RF Nariman, AM Khanwilkar, DY Chandrachud and Indu Malhotra, with Malhotra dissenting. On the Basis of Menstruation? Is Sabarimala Temple State Funded? In 1991, Mahendran, a devotee, wrote a petition stating that the temple board, in collusion with the government, was violating temple practises by allowing women into the sanctum and according special treatment to VVIPs. This case was even represented by women lawyers. This was converted to a Public Interest Litigation, since the judgment affected a large number of people. In a substantial judgment, the Division Bench of the Kerala High Court said women between the ages of 10-50 shall not be allowed to enter, as per the existing traditions. The age limit was specified by the Travancore Devaswom Board (TDB), in charge of the administration of the temple. The court also wondered if the Ayyappa devotees formed a separate religious denomination. In 2006, the Indian Young Lawyers’ Association escalated the issue directly to the Supreme Court. This was not an appeal of the 1991 judgment, but it did call that judgment to question. Specifically, it challenged Rule 3 of the Kerala Hindu Places of Public Worship (Authorisation of Entry) Act, 1965, and said all Hindus have the right to enter the temple and denying them the right was a form of “untouchability”. The 2006 writ petition also made a general prayer asking for gender equality in all places of worship. This was eventually interpreted to pertain to only Hindu temples. In 2016, the case came before a three-judge bench, which included Justice Dipak Misra (who was not a chief justice at the time), as well as Justice Bhanumathi and Justice Ashok Bhushan. On 20 February 2017, the bench reserved judgment. On 13 October 2017, the bench discussed five issues that could merit escalation to the Constitution bench. This meant deciding whether the issues were inherently unconstitutional or were misinterpreted, making them illegal. Finally, on 28 September 2018, the Supreme Court removed the ban on the entry of women into the Sabarimala temple in Kerala.